Last Monday, our quilting meeting took place at my home. Slowly but steadily I progress with my hexagon pillow. I tried a new recipe : midway between tiramisu and triffle, with a chocolate sauce... at the end of the meeting nothing was left... it was well appreciated! Wash the strawberries. Cut them in slices. Whisk the cream until it becomes "Chantilly". Mix well the cream cheese (that should be at room temperature) with the sugar. Add to the Chantilly and mix again for 1 mn. 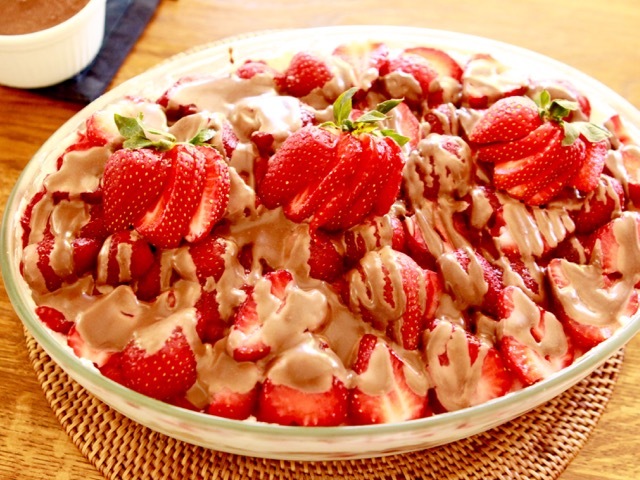 Lay a small part of this cream in your dish, add a layer of biscuits quickly dipped in the cognac, then half your strawberries, and go on this way until you finish. (For my dish, I had two layers). Put in the fridge for at least 4 hours before serving. (I put it overnight). For the chocolate sauce, warm abt 3.5oz fresh cream, add abt 4.4oz bitter chocolate and turn with a spoon until the sauce becomes smooth. Don't refrigerate, it would become hard. Oh those hexies are just so pretty! And as for the strawberry pudding, oh my!! Pretty hexagons. I like the bowl they are sitting in too. Yum those strawberries look delicious Christine. That's it...I'm joining your stitching group just for the food! That looks amazing! Have you ever thought about writing a cookbook? Off to print that recipe! rules this out - pity!! Your recipe sounds delicious and I am going to try it! 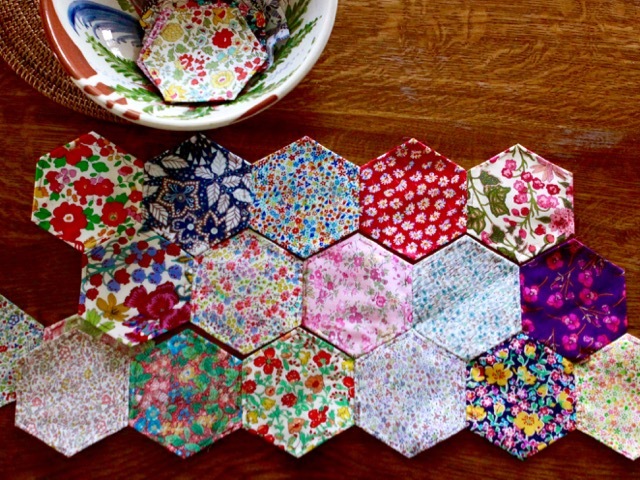 Lovely Liberty hexagons. Your photos just amaze me Christine - you are able to make your hexies look as luscious as your strawberry trifle must have been! Your hexies are very sweet with the small floral prints. You have a very nice collection of these! The strawberry dessert looks delicious. Thank you for the recipe! Les hexagones en patchwork sont éternels, surtout fleuris ainsi, et ils deviennent aussi gourmands qu'un dessert aux fraises : j'adore ce rapprochement ! Those hexies are sweet... and the strawberry dish looks SO YUMMY! I love all the fabric in your hexis'!!! They look as yummy as the strawberry dessert!!! Your pillow will have a wonderful summery feel when it is done! I can't wait for our local strawberries to be ready. Totally delicious... the dessert and the hexies! 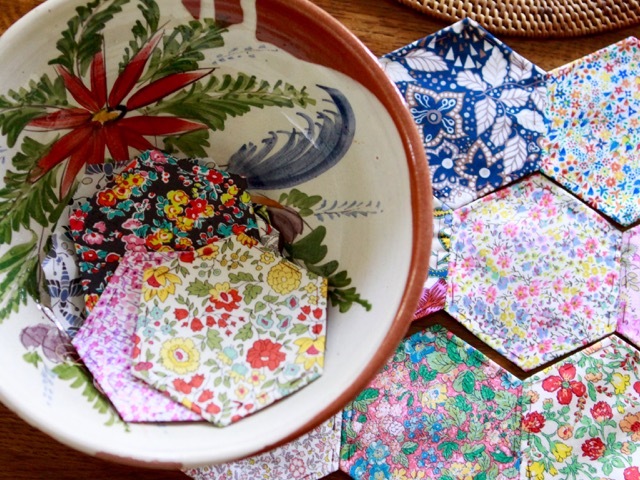 What a great combination - pretty fabric, very sweet hexies and a totally delicious-sounding recipe. Love the hexies! 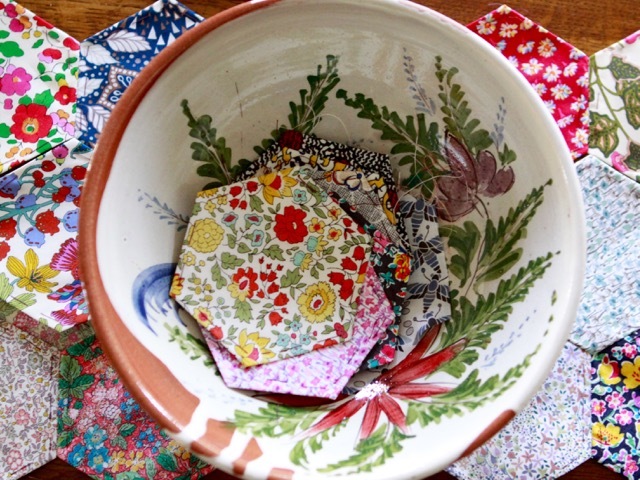 Very nice in a quilt or runner, but don't they look sweet just piled up in the bowl? They both look delicious - great post title! Looking forward to seeing your pillow when its done! Oh I am in love with your hexies!! They are so pretty!! 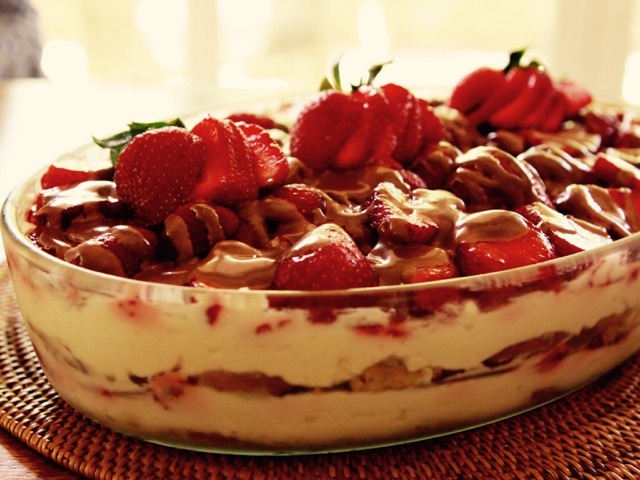 And am also loving your no bake strawberry dessert! Such pretty pictures! Those hexies are to die for! Love them and can't wait to see what they become. I feel like I would need to eat the cake as a reward for making those hexies!